This week, the federal government announced DOT-111 rail cars will be phased out sooner than expected. DOT-111 rail cars were involved in the deadly rail disaster in Lac-Megantic, Quebec three years ago. A similar model of rail cars transported crude oil in derailments near the northern Ontario community of Gogama — including two last year that spilled more than 100,000 litres of crude oil. Although he was critical of CN and their handling of local derailments, Gogama fire chief Mike Benson said he believes rail companies and the federal government want to make it safer to transport goods. In March, Benson said that CN was keeping his people from seeing the derailment site during its investigation, which bred mistrust in the community. And considering that his community has seen two derailments in a short period, Benson said that phasing out the rail cars is a step in the right direction, but other aspects of rail transportation need to be considered. “I think the infrastructure, the [rail] track system, the maintenance that they’re doing on the track system, and I think they really have to look at the speeds when [the trains are] going through municipalities,” Benson said. Marc Garneau, the federal transport minister, said by 2025 no flammable liquids will be permitted to be transported by rail car. Garneau said about 28,000 DOT-111 railcars are still in use, travelling between Canada and the United States. He said the cars may be upgraded, used to transport other goods or sold to be scrapped. Trains coming from the U.S. will be monitored to ensure they comply with the new rules. The oil-train boom is waning almost as quickly as it began. Rail became a major way to move crude after companies began unlocking new bounties of oil from shale formations, with volumes rising from almost nothing in 2009 to more than one million barrels a day by 2014, according to the U.S. Energy Information Administration. But those numbers began falling after oil prices started tumbling two years ago, and aren’t projected to recover anytime soon. In April, just 430,000 barrels of oil rode the rails each day, according to the latest federal figures. Some of the decline came from a drop in U.S. oil production, but oil and rail executives say the drop-off may be permanent. “At least some portion, and it could be a pretty large portion,” of the rail business won’t return, said Union Pacific Corp. Chief ExecutiveLance Fritz. More pipelines have begun reaching North Dakota and other shale regions, giving producers a cheaper way to move their oil to market. Also, a string of fiery crude-freight-train derailments—including one in Lac Mégantic, Quebec, that killed 47 people in 2013—have prompted a host of new and expensive regulations, and fueled opposition that has helped delay major rail projects on the West Coast, where a dearth of pipelines makes rail useful. Regulators have mandated new safer tank cars, and older tank cars are being phased out—adding to future costs for transporting oil. 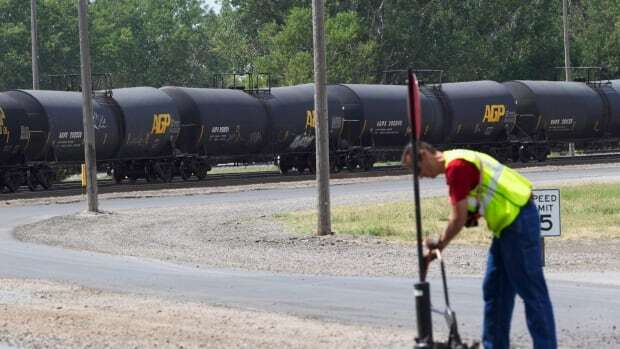 The changes are evident in North Dakota, once the epicenter of the crude-by-rail trend. Oil output from the state’s Bakken Shale formation has fallen by 180,000 barrels a day from its 2014 peak. Meanwhile, pipeline takeaway capacity has more than doubled since 2010. EOG Resources Inc., one of the first oil companies to see the potential for trains to relieve pipelines, opened its first rail loading terminal in Stanley, N.D., in 2009. But that terminal hasn’t loaded a train in more than a year, according to Genscape, a data provider that tracks activity at U.S. rail terminals. “New pipeline infrastructure has been put in place to move significant volumes of oil to market,” an EOG spokeswoman said. Enough pipeline capacity is coming online to replace all of the current volume BNSF Railway Co. is shipping out of North Dakota, said David Garin, the railroad’s group vice president of industrial products. BNSF used to transport as many as 12 trains daily filled with crude primarily from North Dakota’s Bakken Shale, carrying about 70% of all rail traffic out of the area. Now it is down to about five a day. Even at its height in 2014, crude-by-rail accounted for less than 2% of total rail volumes, according to Association of American Railroads data. But its decline threatens what was once viewed as a sizable driver of growth for the railroad industry, one that many rail companies, along with oil and gas producers, made investments to support. Between 2010 and 2015, 89 terminals were built or expanded in the U.S. and Canada to load crude on trains, and nearly as many to offload it, according to consulting firm RBN Energy LLC. The oil pouring out of U.S. fields was so much cheaper—more than $20 a barrel below international benchmark prices at times—that refineries were eager to pay higher rail shipping costs in exchange for some of it. New pipelines have helped shrink that price difference by allowing the landlocked oil to reach market. And the U.S. has lifted a ban on crude exports, which allows American crude to be sent abroad freely and is expected to help keep U.S. and international crude prices more closely aligned. Now oil trains are competing against tanker ships carrying foreign crude. Analysts say rail deliveries are likely to fall even further once shipping contracts signed during the boom expire in the coming months. There could soon be more than enough space to carry away all Bakken oil through pipelines now in the works. Phillips 66 is partnering with pipeline company Energy Transfer Partners LP to develop a pair of pipelines that will bring North Dakota crude to Illinois and then down to Texas. The endeavor, which will cost close to $5 billion, is expected to take a major bite out of oil train traffic, even though the pipelines will ultimately bring oil to the Midwest and the Gulf of Mexico, rather than to the East and West coasts, where trains have primarily taken it. Phillips 66 said earlier this year it may still be cheaper to take that oil and put it on a barge for delivery by sea to the coasts than to send it directly there by train. MONTREAL — Canada will put a stop to the transport of crude oil by older and less crash-resistant tanker rail cars earlier than scheduled, Transport Minister Marc Garneau announced Monday, however, the timeline for ending similar transportation of all other flammable liquids remains the same. As of Nov. 1, crude oil in Canada will no longer be transported in DOT-111 tankers — the same kind of rail car that was involved in the Lac-Megantic tragedy in which 47 people died three years ago. The DOT-111 cars without thermal layers of protection were scheduled to be phased out for the use of crude oil by the previous Conservative government by May 2017. DOT-111s with thermal protection were to be taken off for oil transport by March 2018. The new directives are for crude oil only, Garneau said, adding the phase-out deadline for DOT-111s carrying other flammable liquids is 2025. Garneau said while he was able to accelerate the phase-out of DOT-111s for crude, the government needs to be “realistic” about other materials. “The reality is that in this country we transport a huge amount by rail — hundreds of billions of dollars worth a year — and you can’t do everything in one shot,” he told a news conference. Vicki Balance with the Canadian Association of Petroleum Producers said the oil industry knew the Liberals were considering making changes but didn’t know what they were going to be. “(The announcement) brings some certainty and predictability for us, which is positive,” she said. On July 6, 2013, a runaway freight train pulling 72 crude-oil laden DOT-111s derailed and exploded, killing 47 people and destroying part of downtown Lac-Megantic. In response, the U.S. and Canada created a series of new regulations to make rail transport of hazardous materials safer. Former Transport Minister Lisa Raitt and her U.S. counterpart Anthony Foxx in May 2015 announced new regulations for tanker cars made after Oct. 1 of that year, for transporting liquid dangerous goods across the continent. The new cars, known as TC-177s in Canada, are made of thicker steel than the DOT-111s and have other added safety measures. Raitt and Fox also announced that all DOT-111s would have to retrofitted or phased out for the use of crude oil by 2018 and all other rail cars transporting any dangerous, flammable liquid would have to meet new safety requirements by 2025. Garneau said Monday the new rules will only apply to Canada. He said no DOT-111 train originating from the U.S. and carrying crude oil will be able to cross into Canada after Nov. 1, and violators will face financial penalties, but he didn’t say how much they would be. Garneau said there are about 30,000 DOT-111s without a thermal layer transporting crude oil on railways in North America. He didn’t have a precise number for the cars with the protective layer.